Cost: $200-300 (average for non-specialized units). Prices on ultra-high performance torque converters can run into the thousands of dollars, depending on application. 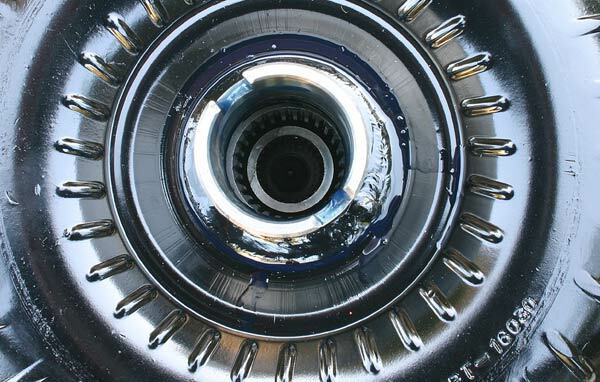 Tip: Consult with torque converter manufacturers before selecting a new converter. 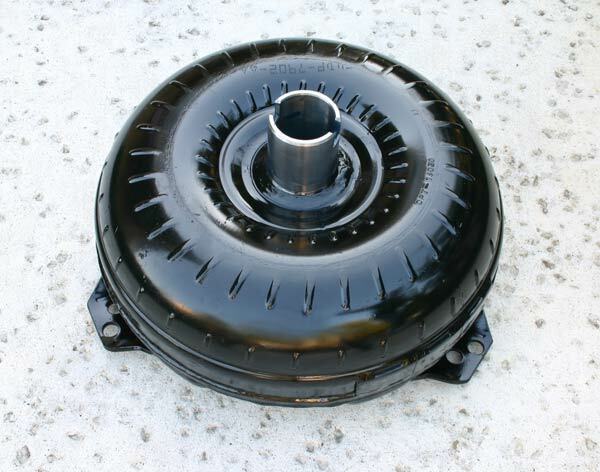 The torque converter case is mounted as shown to the flexplate with the front snout of the unit mating with the transmission input shaft. A series of directional blades which carry and transfer fluid make up the internals of the converter. The individual pieces of the torque converter case are welded together at the seams to provide strength and rigidity. An exploded view of a torque converter. Torque converters are to the automatic transmission what a clutch is to a manually-driven transmission. It allows the engine to idle with the transmission in gear by internally disconnecting the engine RPM from the transmission. They also allow the transmission to be smoothly shifted through the range without requiring the throttle to be closed during the shift. 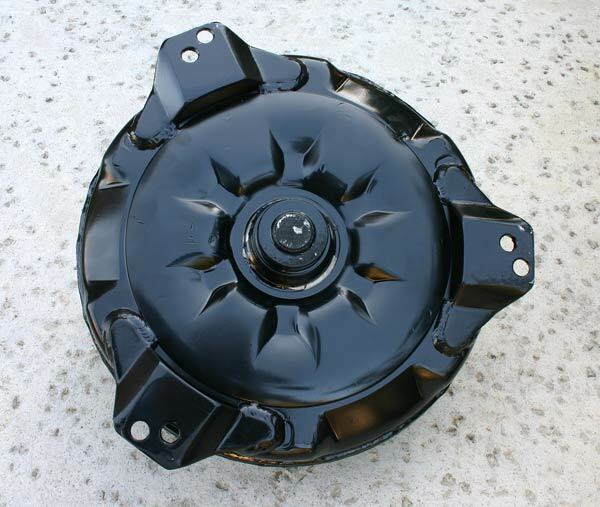 Torque converters are spherical metal cases that house three sets of blades. They are bolted to rear of the crankshaft at the transmission flex-plate, and generally rotate with the engine at RPM (similar to a flywheel). 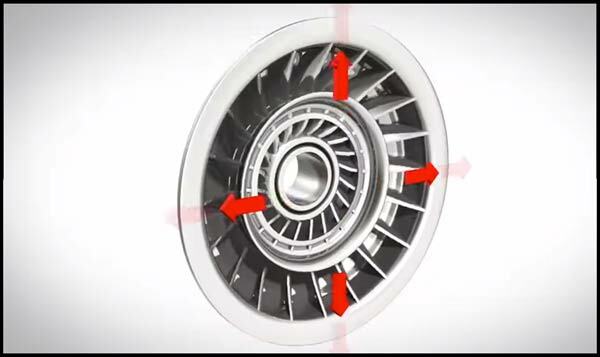 The first set of blades is attached directly to the converter’s case and forms what is called the impeller, or the pump. 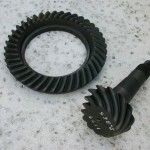 The second set is connected to the transmission output shaft and is referred to as the turbine. The third set of internal blades is mounted onto a hub and a stationary shaft through a one-way clutch, and is known as the stator. The torque converter operates in a similar fashion as a fan. If you place two fans closely together and supply power to only of them, the blades of the non-powered fan will slowly begin to turn. A torque converter uses the same principal; however the medium is fluid, not air. The primary reason to ever change the torque converter in your car is to evenly pair up the performance of the engine with the driveline. If you make any significant changes in your engine, the balance between the engine/driveline components has most likely been altered or thrown off (automatic transmission-equipped vehicles only). Selecting the right torque converter can eliminate these problems and maximize the power generated from your engine. To choose the correct converter, you need to truly be aware of your car’s capabilities and its limitations. The engine’s powerband, the rear gear ratio, the weight of the vehicle, and its overall purpose are all very important and relative pieces in the torque converter equation. The most crucial component to consider when shopping for a new converter is your camshaft. The profile of the cam dictates the opening and closing of the engine’s valves, thus creating its powerband. If you run a stock or near-stock hydraulic camshaft, there is no additional load or burden on the torque converter– a stock converter will perform suitably. If the profile of the camshaft is more aggressive and yields long-duration opening and closing of the valves, a higher stall speed torque converter is necessary to allow the engine to enter its higher-than-stock powerband. Aftermarket torque converter companies usually identify and rate their units by stall speed. Stall speed can be defined as the attainable engine RPM at full throttle while the brakes are locked and the transmission is in gear before the driven wheels begin to turn. However, the stall speed is only attainable if the brakes can hold the car in place. Many still choose to classify converters by the diameter size of the case. Each case size typically represents a small range of stall speeds. The smaller the diameter of the case, the higher the stall speed of the converter. For example, a 12-inch stock converter will produce a stall speed of around 2,000 RPM at its highest point. A smaller, 10-inch unit will produce a stall speed roughly between 2,600–3,800 RPM. This is why knowing the powerband of your engine is such a key element to picking the right converter. A general rule of thumb to follow is to place the stall speed approximately 300 RPM before the engine’s torque peak. 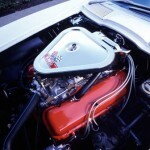 Most stock V8 powered, automatic, rear-drive cars have stall speeds in the neighborhood of 1,500-1,800 RPM. As the engine is modified and more power is produced, the stall speed of the converter should increase along with it. 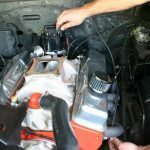 To replace the torque converter, the transmission must be removed from the vehicle. 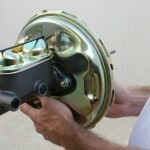 It is mounted to the rear of the crankshaft between the engine block and the transmission case. Remove the flywheel/torque converter cover and loosen the converter mounting bolts at the flexplate. 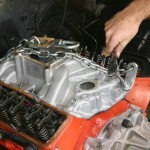 Remove the transmission from the back of the block, along with the torque converter. 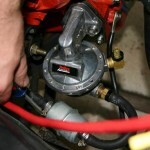 When reinstalling, position the converter back onto the flexplate and torque the bolts to the required specifications. Assemble the rest of the transmission and linkage, and fill with clean transmission fluid.